Kids have great questions about God. In Kids4Truth Club they’ll receive great answers! All children 3 years of age through 6th grade are welcome to join us each Sunday evening (Sept.-May) for Kids4Truth! 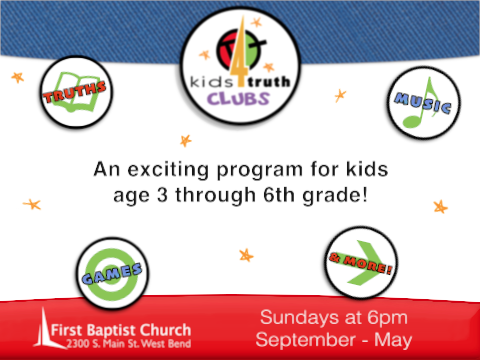 Sundays • 6:00 – 7:30 p.m.
We believe that the Kids4Truth (K4T) program will challenge your child while also helping them thoroughly learn the same truths along with all the children in our club. K4T emphasizes what we see as the 12 Major Doctrines given to us in God’s Word, the Bible. We are covering 3 doctrines this year (2018-19): God’s Word – The Bible, The Greatness of God, and The Goodness of God. The lesson given each night during TruthTime directly coincides with the memory work your child will be working on that week. This will allow you to work as a family and/or one-on-one with your child throughout that week as they prepare to recite the answer and verse assigned. Games and physical activities are a part of each club to both reinforce what we are learning as well as to build friendships with other clubbers. We are very excited about our K4T Choir program that is a part of each regular meeting. Along with our goal of building right affections and appreciation of good music in our kids this will also be a time for the children to learn songs that reinforce the truths they are learning in club. Additionally it will give them an opportunity to prepare for special upcoming programs such as Christmas, Missions Conference, Easter and the K4T Closing Program. There is a flat start-up need of just $15 per child – this will include their book, t-shirt, and award bag (returning kids – $5 per item). All children are welcomed at K4T regardless of their ability to cover the cost of the program. To learn more about K4T, please visit the kids4truth website or contact Pastor Caleb Roth. We encourage parents to attend our Adult Bible Study during Club time. Transportation is also available if needed. Please call our church office at 262-334-9211 for details or you may contact us.